You are here: Home The Market How Strong Is The Bearish Case For Stocks? Comments Off on How Strong Is The Bearish Case For Stocks? U.S. manufacturing activity slowed sharply in January on the back of the biggest drop in new orders in 33 years while construction spending barely rose in December, pointing to some loss of steam in the economy. “The disappointing data provide further confirmation of a dramatic slowing in economic growth momentum,” said Millan Mulraine, deputy chief economist at TD Securities in New York. The Institute for Supply Management (ISM) said its index of national factory activity fell to 51.3 last month, its lowest level since May 2013, from 56.5 in December. The negative data spilled over from the fundamentals into the technicals. 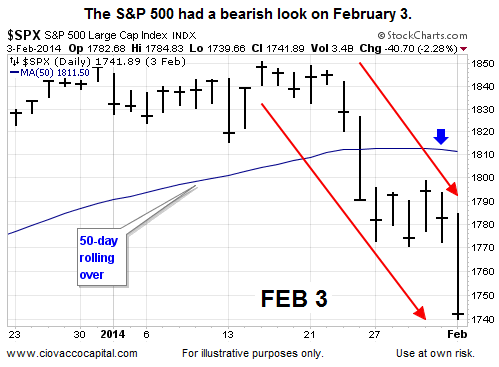 The chart of the S&P 500 below shows a vulnerable stock market on Monday, February 3. There are eerie parallels between the stock market’s recent behavior and how it behaved right before the 1929 crash. That, at least, is the conclusion reached by a frightening chart that has been making the rounds on Wall Street. The chart superimposes the market’s recent performance on top of a plot of its gyrations in 1928 and 1929. The picture isn’t pretty. And it’s not as easy as you might think to wriggle out from underneath the bearish significance of this chart. The chart above is a form of forecasting. The forecast created fear. Forecasting brings bias. In this case, the 1929 forecast created a bearish bias for many investors. What did the evidence say to do on February 11, the day the 1929 chart appeared on MarketWatch? The evidence said “take a second incremental step to increase exposure to stocks.” The time stamped tweet below was based on facts in hand, rather than bias, fear, or a bearish 1929 forecast. Were we aware of the 1929 parallel when we added to our stock exposure on February 7 and 11? 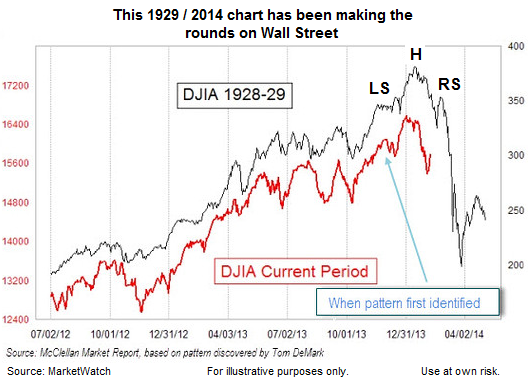 Yes, in fact we wrote about the 1929 chart in a February 11 article. For all the talk of a crisis at the start of the month, February ended up being the best period for global markets since July. Stocks, bonds and commodities rose together in February for the first time in seven months, reversing January’s losses in equities and raw materials. The Standard & Poor’s 500 Index has closed at a record for two straight days, erasing losses from January spurred by concern economic turmoil would spread from emerging markets as the Federal Reserve began reducing stimulus efforts. Traders blamed the late-day reversal in sentiment on news reports indicating intensifying tensions in Ukraine, whose government collapsed nearly a week ago following weeks of protests in Kiev. News agencies reported an incursion of Russian military forces in the Ukrainian region of Crimea. U.S. officials said they were closely watching the latest developments. “You see headlines like that, and you get a little spooked,” especially ahead of a weekend, said Sal Arnuk, co-head of equity trading at brokerage firm Themis Trading. But Mr. Arnuk played down the potential for any conflict in Ukraine to affect financial markets. “If anything, it’s an overreaction,” he said. If slow growth, rising inflation, or tensions in Ukraine are to derail stocks, which they may, then we know with 100% certainty the concerns will eventually show up as observable and bearish shifts on the chart of the S&P 500. That bearish shift could start Monday, but it has not occurred yet. 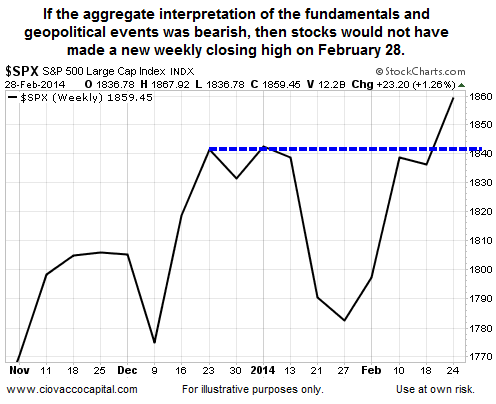 On February 27, we noted the bullish significance of the S&P 500 printing a new all-time closing high. We can add a new all-time weekly closing high to the list. When we look at the chart above, it helps us understand the concept of “the market does not care what you think”. The expression is harsh, but our personal opinions have little impact on asset prices. What matters is what the market thinks, or the aggregate opinion of future economic outcomes. When the market gets concerned/bearish, then we should be concerned as well since the odds of investment success will become less favorable. The evidence in hand calls for an allocation heavily slanted toward “risk-on”. Consequently, we own U.S. stocks (SPY), and technology stocks (QQQ). Given the improvement seen over the last five trading sessions, we added to our stock exposure Friday for the sixth time since making the first incremental buy on February 7. When the evidence shifts, our rules-based system will call for an incremental reduction in equity exposure. When will that happen? You will have to ask the millions of people around the globe that make up the aggregate opinion driving asset prices, or you could follow the charts with an open, flexible, and unbiased mind.